The Youghiogheny River Lake is a flood control reservoir owned and operated by the U.S. Army Corp of Engineers. The Youghiogheny River is popular among white water and canoe enthusiasts. Boaters consider Youghiogheny River Lake the best power boating and water-skiing lake in southwestern Pennsylvania. The river is known as a hotspot for walleye and large mouth bass making it popular among fisherman. With so many activities to enjoy on “The Yough”, it’s important to have a dock that meets your needs. The Youghiogheny River Lake changes dramatically, so much in fact that not your ordinary dock will do. Metal Craft Docks had the pleasure of manufacturing a 100% custom made dock for the challenging river in the summer of 2016. The system was comprised of 5 x 10, 5 x 15, 4 x 10, and 4 x 12.5 foot sections on a custom designed aluminum welded frame. 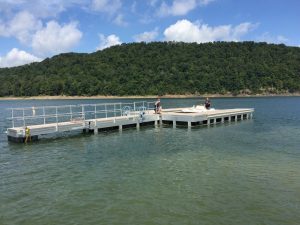 The dock frame was designed to “wrap” environmentally safe polyethylene encased flotation to prevent damage from debris floating after storms. A custom cabling and winch system allows for the private dock owner to move the system in or out from shore as the water levels fluctuate. Superior non-skid, baked poly acrylic finish in earth sand will provide years of safety for boaters and swimmers entering and exiting the dock. We here at Metal Craft are very proud of our history; History that dates back over 80 years when two German fabricators started a small fabrication shop in Cleveland, Ohio. 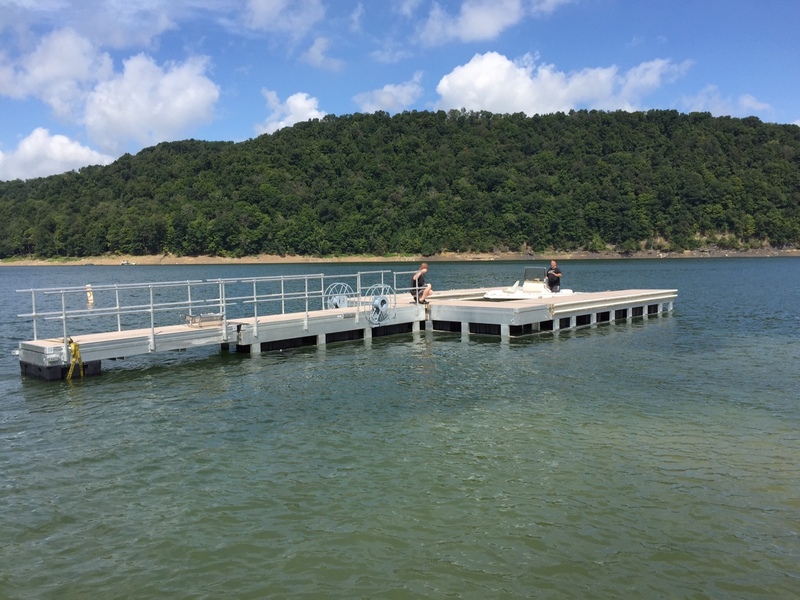 Metal Craft Docks and Lifts are made entirely of aluminum so they are naturally light-weight making installation and removal for storage easier. We are proud of the craftsmanship that goes into every one of our products manufactured locally in our Mentor, Ohio facility. When you purchase a Metal Craft Dock and Lift you are making an investment. The oldest know floating system has been in use on the Scioto River in Ohio for over 45 years! We know you will be happy with your Metal Craft purchase for many decades into the future!